Vancouver Students Call Out Movies that are #NotSmokingHot! February 20, 2017 (Vancouver) – In the lead up to the glitz and glamour of the Academy Awards night, there’s one group that isn’t dazzled. Students at Vancouver’s David Thompson High School are calling out movies that are “#NotSmokingHot” in an effort to raise awareness about smoking in movies and how it entices youth to start the deadly habit. 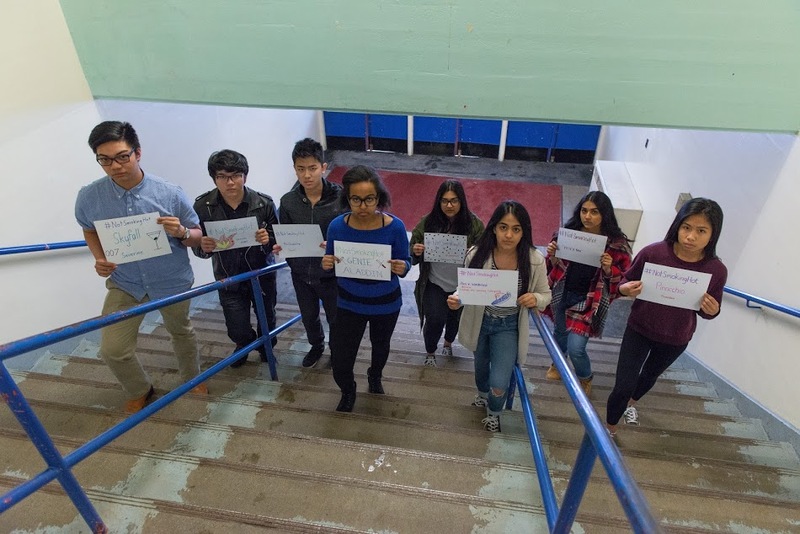 Students with the SACY Health and Wellness Club at David Thompson High School have been learning about smoking in movies, the connection with youth smoking– and they are not impressed. Compelling international and Canadian evidence links youth smoking to smoking imagery in films. “Canadian research found that between one-third to one-half of high school students started smoking, because of their exposure to smoking on screen. And when a young person’s favourite movie star smokes, they are even more likely to start smoking; this is even more pronounced among the children of non-smokers” said Scott McDonald, Chair of the BC Alliance for Healthy Living and CEO of the BC Lung Association. This year 15 movies, 71% of the Oscar nominees, feature smoking. In BC, all but one of the 15 are rated for youth audiences. By contrast, in the USA only 7 out of the 15 are rated for kids under 14 years of age. The students have started a social media campaign among their peers to shine a spotlight on the issue. Using the hashtag, #NotSmokingHot, students are calling out movies that have smoking in them and asking whether smoking is necessary to the story or to portray the character’s rebelliousness, coolness or glamour. Scott McDonald is pleased that the students are working together to educate their peers but thinks there is a simple and more effective policy solution.